Exit Heather Farm Park and head east on the Canal Trail for the first few miles to Treat Blvd in Concord. Clayton is located around the foothills of Mt Diablo with grand views of the mountain-WOW! The road exits through town pass the ranches and farms towards Rodie’s Feed. Watch for the whimsical wood stump carvings! Lunch at the Regional Preserve. This descent can get very fast-proceed with caution as there are many blind turns on this narrow single lane road! The views dropping down into Livermore are phenomenal! Continue west on Highland Rd; it’s a quiet back road with minimal traffic on gentle rolling terrain through the open space with rolling soft golden hills and a few wooden barns. Highland Rd leads to the intersection at Carneal Rd with wonderful views of the freshly plowed hay fields and the open pastoral lands surrounding the horse ranches. Head north on Camino Tassajara; this road has a fair amount of traffic-use caution! 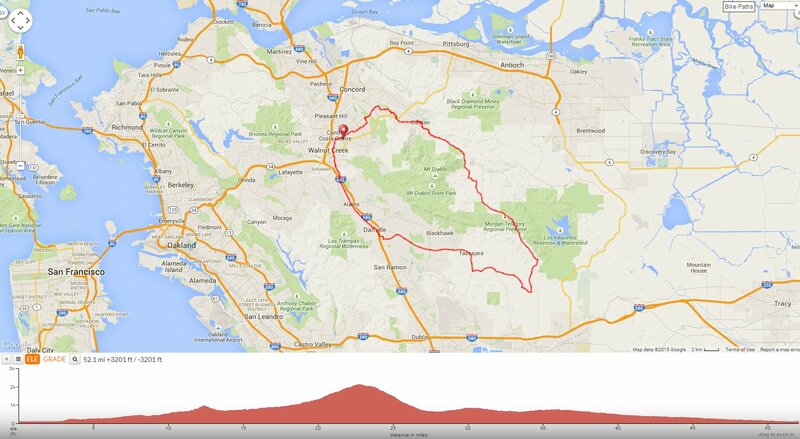 This is a gorgeous ride around the foothills of Mt Diablo from Clayton to Morgan Territory Regional Preserve. You’ll enjoy the quiet remote country roads with minimal to no traffic! Look for the Mt Diablo Globe Tulips-they’re endemic to Mt Diablo! Weather: Sunny and warm with clear blue skies. Temps ranged from the high 50’s to the low 80’s with brisk SW winds. This is a beautiful ride. I rode this route once with you and want to ride it again someday. Your club members were very caring and took care of us. Thank you, your commentary along with pictures and description is very inviting.